The Hermit Crawmad (シャコモドキ?, lit. 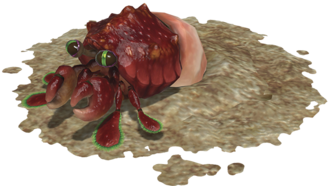 : "Pseudo Mantis Shrimp") is an enemy in Pikmin 2 and Pikmin 3, and the first known member of the crawmad family. They are similar to stout lobster- or shrimp-like crustaceans whose claws resemble those of squillas, but are in fact related to hermit crabs. These enemies live their lives in holes, and pop out when prey approach. With a quick lunge, they can catch their target, reel back, and feed on it in its burrow. This is the only enemy in the series to vary in size, which is random every time they are generated on a map. They only have different sizes in Pikmin 2, and their size does not change the amount of Pokos or Pikmin seeds they are worth. Their nest also varies in size to accommodate the creature's. A Hermit Crawmad within its hole in Pikmin 2. The Hermit Crawmad is a semi-passive creature. It sits inside its hole, and is usually found around watery areas, although it can survive on dry land as well. It will peek out of its hole when the Pikmin or leaders approach it and it will attack if one gets too near its dwelling. It attacks by charging out of its hole and grabbing a Pikmin, then backpedaling to its nest, where the Pikmin is eaten. If it misses, it will turn back around and return to its dwelling, slower than usual. It can climb walls if it is necessary for it to get back to its nest. While sitting on the nest and peeking out, if it can no longer see prey nearby, it'll retreat back inside. In Pikmin 2, its nest will disintegrate if it is killed, but will always remain in the sequel. Lure it out of its hole by moving some Pikmin near the nest, then run away. It'll come out and try to get a Pikmin. Whistle the Pikmin to safety, and when the creature starts to turn around, swarm its backside. Another strategy would be to move the current leader to lure the Hermit Crawmad away from its hole, then swarming it. In Pikmin 2, you can also use Purple Pikmin to stun the Hermit Crawmad on its way back to its hole, and in Pikmin 3, dodging is a great way to get out of the way of an incoming Crawmad. Charging is also very useful for a swift victory. Go near the hole and wait a second, then run. It'll come out. Proceed to punch its backside. This will have to be done multiple times to finish it off. If the player petrifies a Hermit Crawmad while it is performing its lunge out of water, and then pushes the creature into the water, it will generate the splash effect even though it's not moving. If the enemy dies, the effect will stay there forever. While petrified and on the water, a Crawmad can be damaged simply by having Pikmin walk into it. The reason for this is not known. The "Hermit" part of the enemy's name refers to the real world hermit crab, given how both creatures have a vulnerable abdomen that they wish to keep hidden most of the time. Its Japanese name is シャコモドキ?, which loosely translates to "Pseudo Mantis Shrimp" or "Fake Mantis Shrimp". Its scientific name is Camabarus rustica. Camabarus is a play on the real world genus for crawfish – cambarus – and rustica is related to the Latin rusticus, which means rural. Internally, this enemy is called jigumo in Pikmin 2, which is the Japanese name of the atypus karschi, a type of spider. In Pikmin 3, the internal name was changed to simply shako, which is part of the Japanese name (シャコ?). A Hermit Crawmad in Pikmin 2. A Hermit Crawmad scuttling back to its hole. The Hermit Crawmad in the Bingo Battle map Stagnant Sea. It can be seen on player 1's screen. A Hermit Crawmad peeks out from its burrow. Side view of an Hermit Crawmad. Official artwork for the Hermit Crawmad in Pikmin 2. The creature's e-card, #34 (7th red card). The nests of Hermit Crawmads are the only enemy-related object not to appear in the game's early configuration files, making it likely that they were originally going to appear without the nest. While the Piklopedia entry states that the Hermit Crawmad's pincers evolved into a fin shape, in Pikmin 3 they were changed to actual pincers, possibly to match the Bug-Eyed Crawmad's design. Due to a glitch, the Hermit Crawmad may possibly die in the Piklopedia. This page was last edited on March 23, 2019, at 18:01.